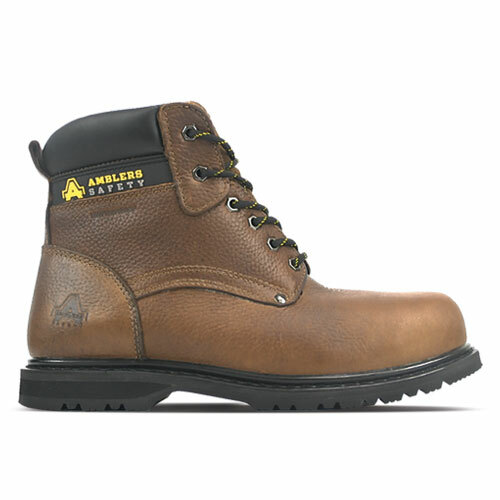 A classic men's workboot in a traditional design from UK brand, Amblers Safety. Crafted using a Nubuck leather upper with six industrial strength hexagonal eyelets. Padded collar with smooth contrast black PU overlay, not only provides comfort, but also prevents debris entering the footwell. Cushioned tongue with flexible brushed suede leather. A waterproof breathable membrane sits between the leather outer and soft mesh lining keeping feet dry yet also wicks moisture away from inside the footwell. Industry standard impact and compression resistant protective steel toe cap and steel midsole. Injected PU welt and midsole with rubber outsole provides a durable last in tough working conditions.